Does this happen to anyone else where you are supposed to be doing responsible things like cleaning and going to the gym but end up tinkering with recipes in the kitchen instead? No? Just me? Well ok then. This was my Sunday morning. I had a plan. It was a good plan. It failed when I started cleaning out the fridge and realized I had some zucchini that was going to go bad soon and needed to figure out how to work it into my menu planning. Rather than just making a mental note to do this after my chores were done…you guessed it I just did it. 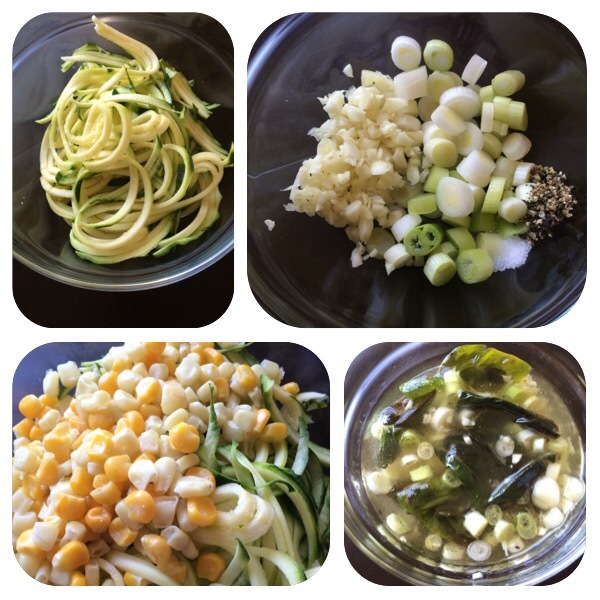 I perused the Pinterest for easy zucchini recipes and decided I didn’t like any of them but it did spark an idea deep in the nomnom center of the brain. That is a sciency term, in Bettyland, in case you were wondering. I am calling this a salad because it is made of cold, raw vegetables and has a delightful dressing. Though you could really call this a medley or chilled side dish. A rose by any other name and all that. Really all that matters is that it is delicious, can be made ahead of time, and doesn’t require any crazy special skills. If you can chop, slice, and mix then you can make this. I used previously thawed corn kernels because I had them on hand, but take advantage of fresh corn straight off the cob if you can! To make basil olive oil, place fresh basin in a jar and completely cover with olive oil. Let rest in the fridge for at least a week to flavor the oil. I left mine in the fridge for almost a month and oh goodness gracious it is heavenly. For this recipe, I used the oil and the leaves as part of the recipe though you can use just the oil for vinaigrettes or dipping sauces. If you don’t have time for this step (or are like me and making this recipe spur of the moment) you can substitute ¼ cup loose basil leaves and a scant ¼ cup olive oil. The apple cider vinegar is Braggs ACV with the mother. I prefer the taste of Braggs as it is not as harsh as some of the other brands I have tried. You could also substitute the ACV for a white wine or sherry vinegar as they both have a more mild vinegar flavor. (That is the nice way of saying don’t be an idiot and use something like a balsamic vinegar with that in your face vinegar flavor punch). Either spiralize or shave the zucchini (either way discard the very center with the seeds) and place it in a medium sized mixing bowl. Add the corn kernels as well. In a smaller mixing bowl add the chopped scallions, minced garlic, salt, pepper, basil oil, and apple cider vinegar. Use a fork to pseudo-whisk this mixture together. Immediately pour the dressing over the zucchini and corn and toss ingredients to ensure they are evenly coated. This can be served immediately but I strongly suggest you let this marinate in the fridge for at least 30 minutes. A few hours would be best in all honesty. Serves 4 as a side dish. Or if you are anything like me, you are going to add some protein such as cannellini beans to this and make it into two lunches. We’re not much for raw zucchini… how would this be with cucumber? I think it would be good with an English/seedless cucumber. I might decrease the oil a bit though.